Whales, knitting/felting scabbards, ring pulls and bad looken-beanies – Craft-a-licious . .
Oh yesss, I bet you just can’t wait to read about the tid bits I’ve been doing lately!! … or maybe not. Since my last post I am now back across the other side of the country. I only mention this for my own (brain-fading) info., so when I eventually put this into book-form I can instantly see how slack my posting really is or, rather, what a fine procrastinating form I have which (sadly) only improves with age. Our van is currently parked here, Sandstone, Western Australia, which boasts a population of 89, 48 of whom leave over summer. A pub, caravan park and post office are its stand out features, but now it also boasts a seasonal cafe (being shut over the scorching summer months). Here you can have a coffee under a shady fig tree whilst marveling at the gardening skills of the proprietress, Fiona, who is obviously a citrus-growing specialist. Tangelos, grapefruit and lemons abound – not to mention the broccoli, brocollini, kale, beetroot, pumpkin and many other organically grown veges. As there are very few (any?) insect pests for these fruiting crops in the middle of the outback, they can apparently be grown with ease. Another bonus is the fresh fruit and vege-starved tourists that are constantly travelling through Sandstone who are willing to pay a handsome amount for the ravishing oranges, yellows and greens at her self-serve produce stand. Fiona is no one’s fool, and her coffee’s not too bad either. Esplanade market .. damn that all my leather working tools are in storage .. The weather in Hervey Bay, Qld is probably the closest to perfect I’ve come across – in winter. The 15km-odd waterfront esplanade is nothing short of spectacular. Well-tended by an army of maintenance people, the footpath winds its way along many rest spots, toilets and exercise equipment. A path often travelled by retirees in their automated wheelchairs or gophers. Beware, they will sound the horn before running you down. Or, if in a decidedly bad mood, will just run you down. But you can recover just across the road at one of the many cafes whilst bemoaning the ageing population and their poor attitude to your loved one and dog – but possibly only the dog will listen. Whale watching season in Hervey Bay happens between June and October or, if your luck is like mine, you miss the whales migrating up the eastern sea board, so have to make a dash (a few thousand kilometres) down to the bottom of the country to see them lolling around the South Australian coastline, on their migration up from the Antartica. Hervey Bay is also in close proximity to Fraser Island – world’s largest sand island. Close encounters with dingoes abound, as well as many fresh-water lakes, forests and wildlife. Unfortunately they wouldn’t allow domestic animals, like my dog Boo, to go. So neither did we. But it would have been rather nice .. This is a really beautiful locale. The Glass House Mountains and the proximity to the coast, along with a wonderful climate make this well worth seeing. Like most of south east Qld – this is where a lot of retired people either holiday or live. Body parts in 3 different states simultaneously! Here’s Cameron Corner signage … a little underwhelming .. Typical scenery on the way to Cameron Corner, flatness with some greenery and red earth Am happy it’s bitumen. I’d wanted to go to the state corner of where Qld, NSW and SA all meet for some time – and it is quite a way to go from the coast. There’s lots of farmland in between which peters out to desert the closer you get to your destination. The last couple of hundred kms being on gravel. This is the only place in Australia where you can have a body part in 3 states simultaneously without being dismembered. There is a pub where you can also buy fuel and souvenirs. Interestingly, many remote pubs, shops and service stations are often run by young people from overseas – as a prerequisite to a certain Australian visa type. When we travelled to Cameron Corner pub it was managed by a young Irish and English lass. There’s no internet connection, and little in the way of entertainment other than the very few people who pass by. You can, however, play ‘tri-state golf’, though the ‘greens’ are carefully kept, well-oiled, dirt. Landscape look familiar? It would to any Mad Max fan! I’m looking quite dashing in my wombat headwear! The town of Broken Hill’s gone through many changes and is now trying to find its feet since mining is generally gone. However there are a couple of points of interest here that are well worth a look eg. the Royal Flying Doctor Service (RFDS) museum. The RFDS covers the outback for medical emergencies, often using the roads as landing strips – just be a bit careful driving, especially in the evenings, as the lights coming towards you are probably a low flying aircraft and not a UFO. Silverton is also worth the short drive from Broken Hill – it was an old mining town, and used as a set location in Mad Max 2. Now the pub, a few artists and a wandering pack of wild donkeys occupy the old township. The Regional Art Gallery was great – had an exhibition from Alice Spring’s Beanie Festival. Ralph’s ‘Sumo’ beanie was rather apt … (.. she says smugly..). I modelled the Wombat beanie – a stocky animal that wanders around and eats a lot. Also apt! Oh yes, the pride of getting some cookery out of the camp oven – uncharred! Typical Nullabor scenery. No, we’re not lost. This is one long road. Really. And if you’re towing, you’re praying for a tail wind. Even though I found the first few times I travelled it quite boring, I now think it’s quite interesting. Even more so if you’re with friends. Oddly, there are quite a few caves to be found along this stretch of road, that are similar to sink holes. When noting the persistent wind in Western Australia, a local said “well, it’s also no fun for the farmers when there’s a wind drought”. “What?? Never heard of such a thing” – I say, the ever-suspicious city girl. “Yep, they usually occur in summer, so the wind mills don’t pump water for the livestock. Then you’ve got a problem on your hands as the properties out here are pretty big. Thank heavens solar panels are getting cheaper and more efficient for pumping water”. “Oh, yeah, I suppose so” – was my highly intelligent come-back. “We’ve got a native bush-block in south west Qld with scrub turkeys living on it. The funniest thing I ever saw was a turkey crazily riding around on the back of a scared goanna (monitor lizard). Yep, must have got a little too close to that turkey’s nest – boy, did it give that lizard a run for it’s money!”. WikiCamps – this app only costs a few $ and shows thousands of free camps, caravan parks and other points of interest along your journey. Youcamp.com – your gateway to camping on private properties. Spectacular scenery and great facilities that are now available to the adventurous public. I do rather like felting – both fibre and yarn. When living in a caravan – water is a resource that is constantly in the back of my mind, and felting (most often) requires it. 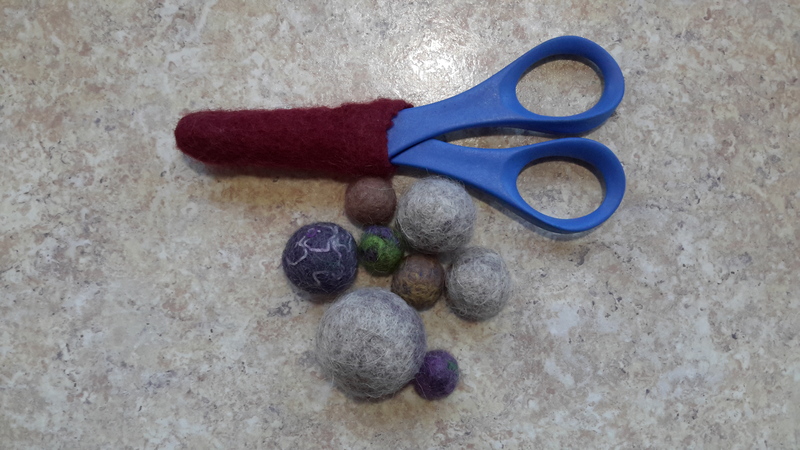 If you don’t have much water – or time, try giving these simple felted balls a shot. My tutorial takes but a few minutes, very little effort and even less water! Woo hoo!! Werked! Felted knife protector! Sheath completed – can now throw its old plastic cover! Vikings. Oh yes, I’d be lying if I didn’t admit to a few lustful thoughts involving King Ragnar Lothbrok (played by Aussie actor and ex underwear model Travis Fimmel). Where else would one gain all worthwhile historical knowledge of a whole region and its occupants than from a TV series?? Yes I was indeed thinking of that series when creating my naal binden for sheathing a bread knife. YouTube videos abound on this technique, and if you use feltable yarn to create your piece – you can then felt it down (whilst binge-watching Vikings) to snugly fit your knives and/or scissors. Frankie Brown, knitting designer of Ravelry fame, creates some fabulous stuff – all patterns of which are free, she only asks for a donation to a charity she supports. This pattern, the ten stitch wave, uses short rows. Knitting short rows sounds pretty simple, but it can take a bit of practise so there are no holes left when ‘turning’ for each short row. For me, the best method is the ‘german short row’ technique, as opposed to the ‘wrap and turn’. Asa Tricosa, knitting wonderwoman , has a wonderful photo tutorial on how to easily do this german short row technique. When weather is both cold and bright – wear this super-becoming (??!!) headwear combo! I’m married. This is lucky as I would have a rather difficult time finding a beau whilst wearing this beanie. Aesthetically, well, I can’t say it suits me terribly well. But my gosh is it warm! I also really like the colours – achieved by using a ball of DK weight (8ply) variegated wool yarn and knitting with both ends of the ball simultaneously. Which is why it’s so warm – double stranded! A lovely friend, Norma, very kindly gave me some fabulous yarn. But I needed more! I decided to knit a piece that was large enough for both my neck and shoulders. I do like a scarf that is bunchy around my neck, ie. not flat. It just seems to be warmer. I had also been reading up on The Golden Ratio also known as the rule of thirds, so decided to use complimentary colours to Norma’s yarn – whilst trying to bring it together using this rule. My neck and shoulder warmer werked a treat, and bunches up even more than the pic when worn under a jacket. Thanks Norma! By gosh I do love them. So many things to be made from them – I don’t think I have enough years left of life to make them all! Again, YouTube is my main schooling on how to do this sort of fantastic stuff. 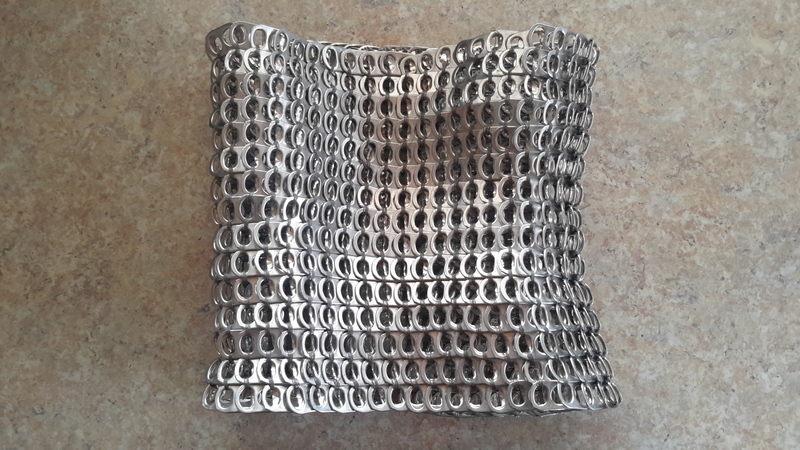 Here is the main part of a current handbag in progress, crocheting the ring pulls using my lovely silk wrapped stainless steel yarn, into a ‘fabric’. Just need to find the disco to wear it to. I’m a little partial to wearing aprons – well, I reckon I would be if I had any – so decided to sew myself one using Handy Husband’s ripped trousers, and a Pinterest pic as my reference. I’m not saying I look terribly flash modelling one of the trouser legs flattened into an apron (refer Helmet Beanie above), but I do feel smugly clever wearing it though! Well, dear Readers, you’ve finally made it to the end of this rather chunky post. Well done! Thank you kindly for taking the time to read my blatherings, and I do hope you’ll find some time for craftiness in your life – wherever you are on the planet. [WARNING! shameless self-promotion follows] If you would like to read more of my travels, pick up a copy of the (Australian) Caravan and Motorhome On Tour magazine for which I write from time to time (ie. when not crafting). Looks like you guys had an amazing time! The over 70s parking gave me a chuckle haha. Happy travels! Thanks Choi! – That Mr Potato Head pork belly looks mouth wateringly fantastic!! OMG!! SO GOOD! haha thanks for reading my post as well! What an adventure. It was interesting to read about. Thanks Sandy, it was a really interesting trip Unfortunately I can’t seem to get my act together to craft as much as I should be whilst driving around though. I’ll just have to keep trying!